Piotr Fafrowicz's limited edition giclee print transforms his hometown into a hyper-saturated dreamland. Polish artist Piotr Fafrowicz makes "illustrations for books that don't exist." Simply look at his paintings and your mind begins to spin equally colorful and surreal tales to go with them. Fafrowicz's paintings often feature oddly angled buildings, inspired by the centuries-old architecture of the Polish village of Kazimierz Dolny, now an artists' colony where he shares a cottage with his wife. "I love the innocence of my town," he says. "I try to capture the exceptional beauty of its Renaissance-style buildings, forested hills, and the down-to-earth attitude of its people in my paintings." In this piece, Piotr transforms his tranquil hometown into a hyper-saturated dreamland that is preserved and replicated in a series of high-quality collectible giclee prints. This pencil signed collectible art print (unlimited edition, sequentially numbered) is expertly printed in North Carolina on fine art archival paper made in Germany since the 15th century. Dream is available either framed or unframed. The frame is hand-assembled in Oregon and consists of Durian wood, a Malaysian fruit tree whose lumber is harvested after its fruit bearing life and recycled into a frame. While the lumber from old fruit trees is reused, new trees are replanted in the fruit orchards renewing the fruit bearing cycle. This art piece is mounted on an FSC-certified and conservation quality matboard. 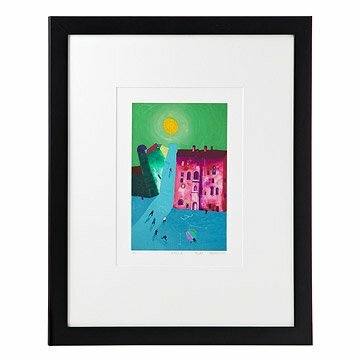 The framed art piece comes ready to hang (wire hanger), the unframed art piece comes mounted, matted and safely protected in a clear bag. Painter Piotr Fafrowicz was born in 1958, and grew up in the centuries-old city of Szczecin, Poland. He studied art history at Catholic University of Lublin, and later trained at Warsaw School of Animation. After painting initially with oils on canvas, he eventually shifted his medium to tempera on paper. In addition to exhibitions in Poland, Switzerland and France, his work has been shown at the Martin Summers Gallery and the Kosciuszko Foundation in New York, and the Institute Internationale in Philadelphia. Two of his illustrated children's books have won the Polish Society of Book Publishers' "Most Beautiful Book of the Year" award. Fafrowicz's work draws upon folk art with surreal and cubist touches. Many of his village scenes are inspired by life in Kazimir Dolny, a Polish village turned artists' colony where he and his wife share a cottage. I love it because I am. 100% Polish, it is of a Polish town and the artist is Polish! I feel a little piece of home when I look at it.